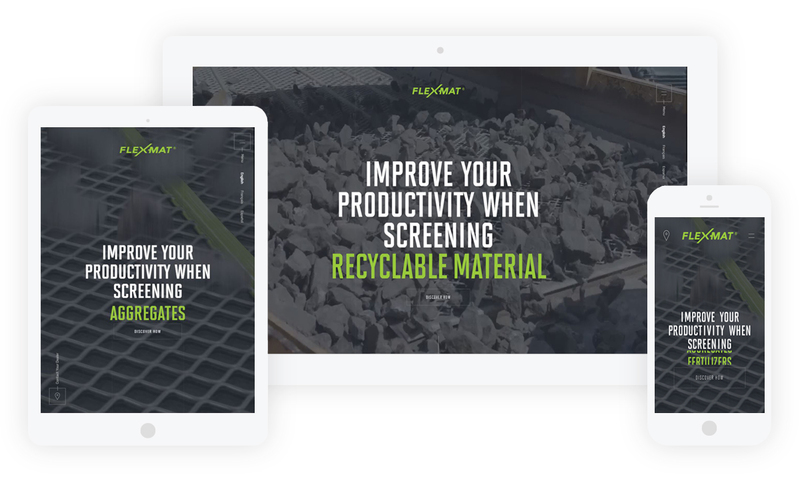 Major Wire recently acquired by German multinational Haver & Boecker, wanted to undertake a complete redesign of its website and content. The sheer volume of information to present, and the particular target audience, made this a sizeable challenge. I was personally asked to help develop and design the layout and functionality of the site as well as provide custom graphic design assets. Inspired by the new visual identity for Major’s Flex-Mat, it motivated the project’s art direction with an eye on conserving visual unity throughout all of the company’s visual supports. An editorial grid was also proposed, allowing the site’s administrator great flexibility in content copywriting, and for interesting opportunities for the platform’s future evolution. Large, bold lettering was created to clearly identify the website’s content and objective. Video backgrounds were added to capture audience attention. Modernity and a sense of “something new” was embedded throughout the design via a modern color palette and detailed animations and overlay effects.